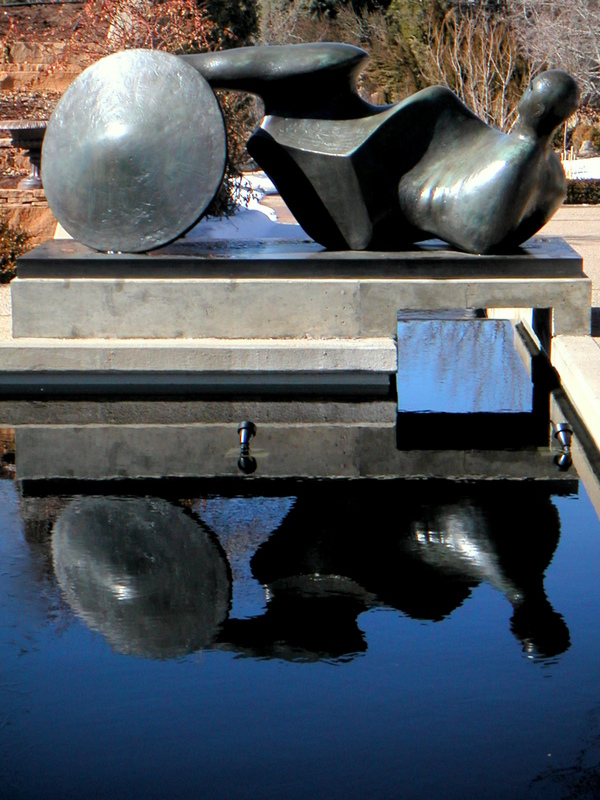 The Henry Moore sculptures at Denver Botanic Gardens have been a joy. Photographing them with different moods under various lighting, plant colors and weather conditions. 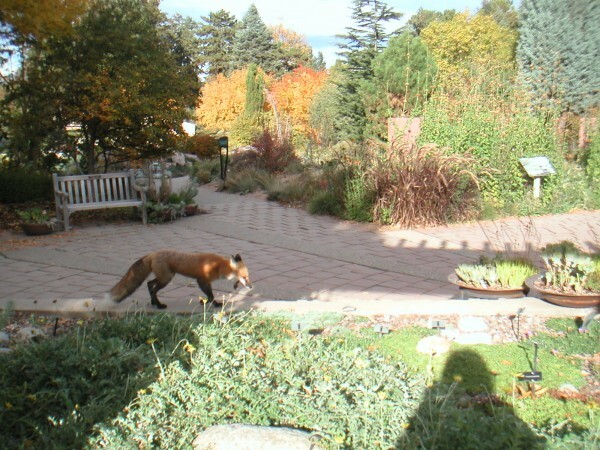 So I was armed with the camera to see if we could capture some fall color and look what stole the show: the elusive foxy lady was out for a Sunday stroll. 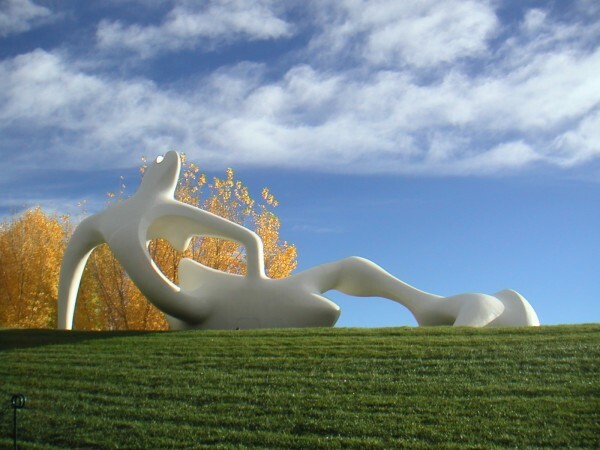 Large Reclining Figure is a white fiberglass – which is how they were able to locate it on top of this hill in the center of the garden. But look at how the primary colors of yellow and blue pop with their combination makes an awesome hunter green. One of my favorites in the Goslar Warrior – could it be more perfectly sited to by the fallen soldier reflected in the pond? 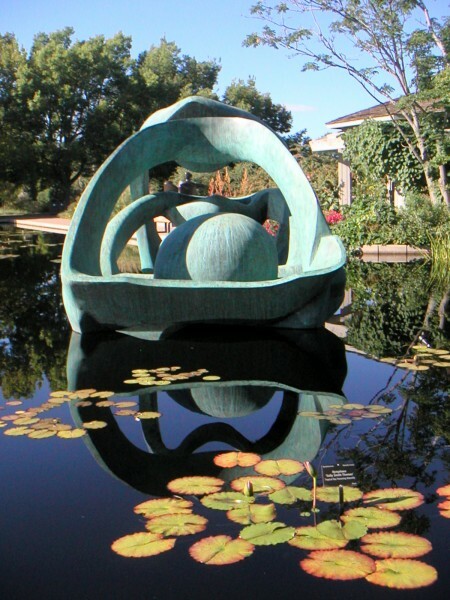 This is named after a town in Saxony Germany and they named Henry Moore the first recipient of the Kaissering Award in 1974 – a prestigeous modern art award that continues to this day. The reflections of Hill Arch add to the depth and mystery of this piece. The installation is such that the concrete platform it sits on is just below the water level. this is the only bronze sculpture that is allowed to continue to patina naturally – all the others are fixed with a wax to keep the finish from changing. This Reclining Figure Angles is perhaps inspired by the Mayan Chacmool – the Rain Spirit at Chichen Itza which was discoverd in 1875. Even though this bronze dates to 1979, the style is similar to ones he was carving in the 1920. These wonderful sculptures are on display until 31 January 2011 – and then they get trucked across country to be shipped back to England. Hope you get to enjoy them and take some of your own photos. 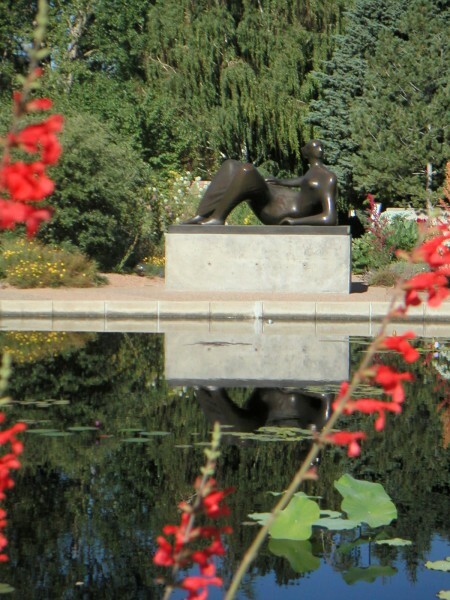 This entry was posted in Art, Colorado, Gardens. Bookmark the permalink.